‘Legal and financial strategies’ relates to the structures that support business investment strategies. ‘Legal strategies’ refers to decisions about what form the business should take in the new market as well as the ways in which a business enterprise forms and manages relationships with other entities for carrying out their activities. ‘Financial strategies’ refers to the choice of schemes and structures through which capital will be made available for cross-border business activity. Financial planning may involve a diversity of public and commercial actors, ranging from institutional investors to private banks, providing different different types of investment support. 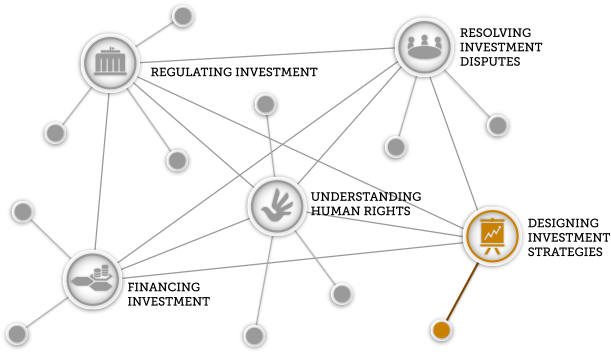 The Learning Hub’s work will seek to clarify the relationship between the design of investment strategies and the avoidance of adverse human rights impacts in the context of investment.